Use With: These shields will work with HJC AC-12, CL-SP, CL-15, CL-16, CL-17, CS-R1, CS-R2, CS-R3, FS-10, FS-15, Kawasaki ZX, Kawasaki ZXSP, IS-16, and Joe Rocket RKT101, RKT201 and RKT-Prime helmets. Some of these shields are Pinlock® ready; you just need to purchase an anti-fog insert (sold separately, see below). Pinlock® inserts are created out of a moisture absorbing plastic. The silicone seal on the Pinlock® creates an air tight double visor. These two features make Pinlock® the best fog resistant system there is. You can keep your visor closed and see everything! 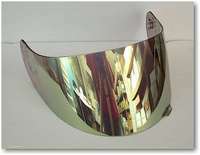 RST Mirrored shields improve eye protection with an increased degree of surface reflection. These shields are coated with a metallic compound in a high vacuum chamber to create a mirrored rainbow appearance. Click the drop down menu to see the shield options that are available.